Leamington manager Paul Holleran has plenty to smile about. 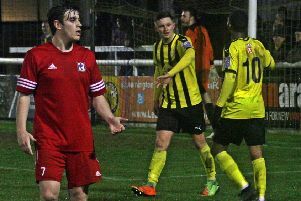 Leamington convincingly overcame Midland League side Lye Town in the Birmingham Senior Cup in midweek to complete a second cup win inside four days. It followed on from their FA Trophy victory over Witton Albion and manager Paul Holleran said the midweek performance was yet another positive in what has been a month to remember for his side. “We had lots of youth and lots of legs. It was important the players that came in performed,” said Holleran. “I had a bit of a tinker with the systems and the level of performance really impressed me. Five wins in all competitions completed a 100 per cent return in the month for Leamington and sets them up nicely for a mouthwatering set of fixtures in December. After a blank weekend, Brakes travel to York City on Tuesday before entertaining title-chasing Chorley. Hartlepool United then visit in the FA Trophy, with fixtures against FC United, Brackley and AFC Telford completing a busy month. 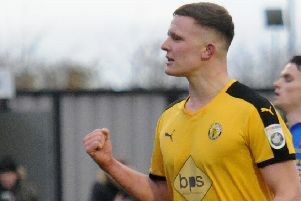 Brakes sit in a lofty 11th position on the back of their recent run of good form having played less games than all but one of the teams below them and Holleran says they have no reason to fear their tricky schedule. “Obviously it’s a big game on Tuesday and we’ll be preparing for that now,” said Holleran. “I’d rather go on a Saturday but we’ve got a bit of a breather. “York are up and down but they are a good side then there is Chorley who are the best side I’ve seen this year. n Young goalkeeper Ben Newey, who has spent time with Burton Albion and Birmingham City before playing out in the USA this summer, has been signed as back up for Tony Breeden.